There has been over a week of rain here in the Pacific Northwest, so a day with sun breaks was much needed. We took advantage of the warmer temperatures and clearing skies to venture out to the woods and breathe in the fresh spring air. There were mushrooms EVERYWHERE, and I literally had to stop myself after photographing about a half a dozen macros. 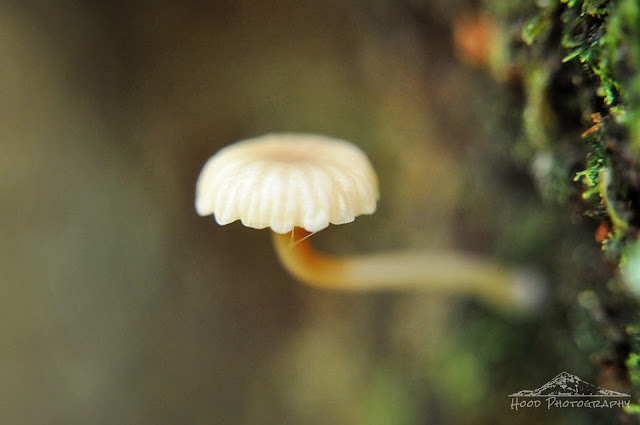 That's a cute little mushroom! It's a good macro shot. We don't typically see explosions of mushrooms until late summer. Oh, honey, I'm so proud that you got out during a sun break and took this special photo. And I'm proud that I know a sun break when I experience one, thanks to living in Portland, Oregon! It's like a tiny umbrella. So delicate! What a lovely photo. It looks to be about the size of some tiny orange ones I saw last fall, but very delicate and I like the scalloped edge. Like a fairy's umbrella! Great shot! Wow! That is an interesting looking mushroom!